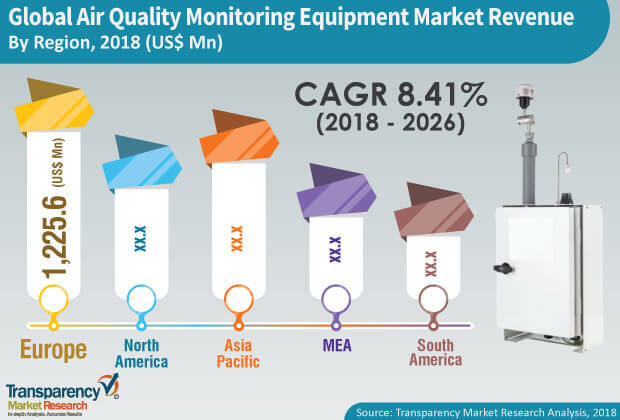 According to a new market report published by Transparency Market Research titled “ Air Quality Monitoring Equipment Market–Global Industry Analysis, Size, Share, Growth, Trends, and Forecast, 2018–2026,” the global air quality monitoring equipment market was valued at US$ 3,715.35 Mn in 2017 and is expected to expand at a CAGR of 8.41% from 2018 to 2026, reaching US$ 7,688.07 Mn by the end of the forecast period. The world has witnessed a dramatic rise in air pollution levels due to increased industrial activity, excessive use of fossil fuels, and meteorological and seasonal factors, among a host of other factors. Air pollution levels continue to be dangerously high in many parts of the world. As stated by the World Health Organization (WHO) in May 2018, 9 out of 10 people breathe air containing high level of pollutants and a million people die due to diseases including stroke, heart disease, lung cancer, chronic obstructive pulmonary diseases, and respiratory infections, including pneumonia caused due to high levels of air pollution. In order to keep the air pollutant quality in check, governments across different regions are imposing strict regulations and guidelines pertaining to emission levels from industries as well as vehicles. For instance, in July 2018, the Maharashtra Pollution Control Board (MPCB) in India, conducted daily tests in various cities for long term assessment of air pollutant levels by measuring the quantity and type of air pollutants in the surrounding outdoor air. Furthermore, governments conduct tests at various locations and impose restrictions in order to ensure that the air pollutants do not exceed the prescribed limits. In terms of geography, the market has been divided into North America, Europe, Asia Pacific, Middle East & Africa, and South America. In 2017, Europe was the topmost revenue generating region followed by North America. The market in Asia Pacific is expected to expand at the highest CAGR from 2018 to 2026 due to growing concerns pertaining to the ill effects on health due to the spike in air pollution in the region. According to the World Health Organization (WHO), more than 90% of air pollution related deaths take place every year in low-middle income countries such as India and China. China is regarded as the world’s largest emitter of greenhouse gases and has many of the world’s most polluted cities. Key players are focusing on the introduction and development of new products to gain a competitive edge and improve brand positioning in theair quality monitoring equipment market. Furthermore, they are engaged in forming strategic alliances with peers and less established players in order to gain a higher market share. For instance, in February 2017, Ecotech joined forces with French company ACOEM which is a prominent player in the space of measuring, analyzing, and controlling environmental parameters. This move will help the company to diversify its product portfolio and accelerate its distribution and access into new markets and industries.The key players profiled in the global air quality monitoring equipment market include Aeroqual, Ecotech, Vaisala, Teledyne Technologies Incorporated, Thermo Fisher Scientific, Inc., TSI Inc., Horiba Ltd., CEM Corporation, Siemens AG, and Kaiterra.